If you have never been to a “Kahn” or “Wright” building this is your chance to experience both! Join AIAS BAC on a day trip to see two architectural masterpieces. We have three cars ready to go and 10 spots are available. 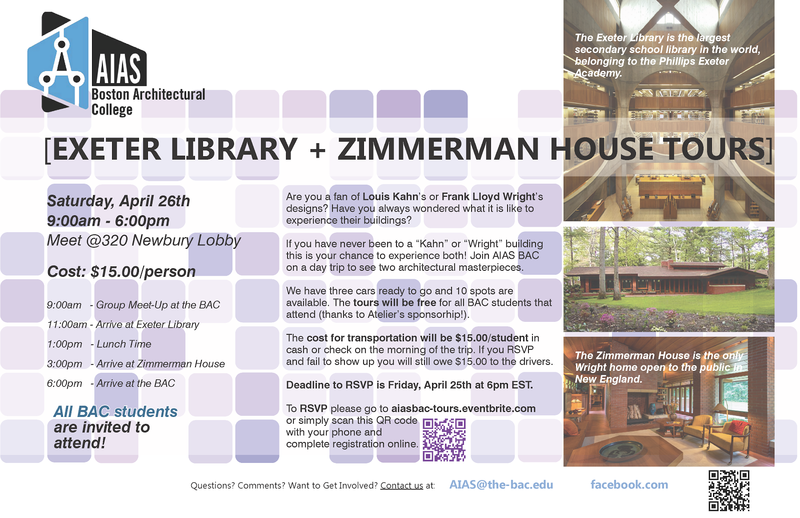 The tour of the Zimmerman House will be FREE for all BAC students that attend (thanks to Atelier sponsorship!). The cost for transportation will be $15.00/student in cash or check on the morning of the trip. Deadline to RSVP is Friday, April 25th at 9 pm EST. Please go to https://aiasbac-tours.eventbrite.com to register for the event. Please contact AIAS BAC at aias@the-bac.edu if you have any questions.